North America’s healthcare giants are opening up to new innovations. The best way to align hospital clinicians and innovation experts is to establish the value of the innovation and then secure a champion to advocate for it at the highest level, “someone who is comfortable about breakthrough insights and acting on them,” said Chris Coburn, Chief Innovation officer at Partners HealthCare, and a former founder of Cleveland Clinic Innovations. Based in Boston, Partners HealthCare includes community and specialty hospitals, a managed care organisation, a physician network, community health centres, home care and other health-related entities. Several of its hospitals are teaching affiliates of Harvard Medical School, and Partners is a national leader in biomedical research. While it is easier for large organisations to ‘dock’ with other large organisations, the challenge for innovative start-ups looking to sell into them “is to create a shared understanding, and ultimately a shared reward,” he said. While for a start-up technology being pitched is its sole focus, for the healthcare system it is just one of hundreds of solutions. “Making sure there is the right level of attention to that technology in the big organisation should be the day and night focus. Getting that cultural alignment takes effort,” said Coburn. The key to doing it is to clearly identify where the decision is being made. In health IT, that could occur in one of many units whereas, with a medical device, you are likely to be interfacing with just one, from which a likely clinical champion is easier to find. “Do your reconnaissance to try and figure out who is going to be making the decisions and have a realistic view of timelines,” he said. Avoid “death by pilot” by agreeing clear end points. The areas of healthcare innovation about which he is most excited are immune therapy and, on the IT side, machine learning and artificial intelligence. “According to a recent report, 86% of healthcare organisations, whether industry, academic or government, are not yet using AI. In 10 years from now, care is going to look a lot different than it is today,” he said. Interest in biosensors is already increasing, said Iris Berman, VP telehealth services at Northwell Health. “There is still a little way to go yet but we are looking very much forward to the predictive analytics that go along with that,” she said. Through her work in telemedicine, predictive analytics is already helping Northwell Health become more proactive. It’s also enabling people to have more control over their care. The result is treatment at home, which is less expensive and allows patients the support of loved ones. Telemedicine can also help in those parts of the population unable to access care, for a variety of reasons. For Robyn Muzeka, Technology Innovation Lead at Adventist Health System in Florida, the move is on to get physicians away from ‘pyjama time’ – the time spent working on electronic health record systems out of hours. One way is through the use of devices that enable them to use ambient technology and machine learning/AI to document information and pull up charts. These are in room but are not as invasive as a microphone they have to speak into. “That’s where I think there is a lot of value,” he said. Adventist is partnering with GE on its mission control applications, using methods of sifting through and analysing data for failings in a way not unlike air traffic control, ensuring patients get to the next level of care as efficiently as possible. Technologies that help with the social determinants of healthcare are also required, particularly as hospitals spend so much time working with people who don’t have insurance, or have limited insurance. Opportunities exist for niche applications for AI such as in scheduling too. For start-ups looking to engage with health systems, the biggest challenge is one of scale, said Muzeka. “In the US, we have small markets and large markets, and sometimes we can’t roll out the same technology in each market. We have to flex, each market has an individual take. Be open with your solutions, be adaptable. If you have something you are willing to pilot we can figure out those other pieces, but remain flexible and open,” she said. Be device agnostic, said Iris Berman. “Interoperability is huge”, as is understanding that hospitals will have a series of legacy systems in place. “Be ready to integrate into existing systems,” she said. Partnering with Enterprise Ireland is giving US giant Northwell Health an innovation advantage. Northwell Health is the largest provider of healthcare in New York State, twice the size of its next competitor, with 23 hospitals and 700 outpatient locations. At 68,000 employees, Northwell is also the largest private employer in the State of New York. Innovation plays a key role at the organisation, both in relation to research activities, investment in external companies, and internal spin-outs. A pioneer in its field, Northwell was the first entity in New York to create an integrated health system and today has revenues of close to US $12 billion. Despite its unique position, Northwell faces the same pressures as many other US healthcare systems, said CEO and President Michael Dowling, in Dublin recently to deliver the keynote address at the North America Healthcare Forum. Organised by Enterprise Ireland, the flagship event brought together leaders from many of the biggest names in the US and Canada’s healthcare sectors. Each faces challenges such as consolidation in their markets, growing use of technology, increased consumerism, greater accountability and financial pressures, he said. Not alone is Northwell competing against some of the world’s best-known healthcare provider brands, such as Columbia Presbyterian, Mount Sinai, and Sloan Kettering, “but now we have to deal too with Amazon, with Google, and with pharmacy chain CVS,” which is looking to take over US health insurer Aetna and turn its retail units into ambulatory locations. At the same time, the sector is increasingly transforming from medical care to healthcare systems, putting a growing focus on the social determinants of health such as lifestyle, behaviours and social issues. Developing partnerships and alliances is an important way of ensuring innovation at Northwell, he said. In December 2016, Northwell signed a partnership agreement with Enterprise Ireland which allows Irish companies early stage access to its clinicians and key decision makers, aiding the development of new products and services for the wider US healthcare market. The partnership also enables Northwell Health to develop and commercialise new medical technologies. Dowling partners with Enterprise Ireland because Ireland is, he said, “an epicentre of innovation”, with a young and dynamic population, an excellent education system and an “extraordinary amount of entrepreneurship.” Since the partnership with Enterprise Ireland was established, Northwell has worked with around 90 Irish companies. Dowling offered advice to others looking to sell into the US healthcare sector. “A company can have wonderful ideas but doesn’t understand fully the delivery systems of how healthcare is actually delivered on the ground.” Partnering with Northwell enables Enterprise Ireland companies to have a greater understanding of challenges such as regulatory issues, legal matters and reimbursement practices. “The technology alone won’t solve it unless you understand the process of care,” he said. “We have worked with 90 Irish companies and it has been a great experience,” said Dowling, citing physical therapy applications developer Salaso, clinical diagnostics company Technopath and medical technology company i360 as examples of innovative Irish companies Northwell is working with. Patient care is at the centre of all its innovation. “At the end of the day, it’s all about what benefits the patient,” he said, advising companies wishing to succeed in this market to be careful of how they pitch to major healthcare systems in the US. Be aware that technology by itself doesn’t answer most problems. “When you are in the business of taking care of people, you use technology to augment what you do, not to replace it. You don’t want to become a prisoner of technology. The technology people who understand the human element are the people you give more traction to,” he said. The future of healthcare solutions is likely to be increasingly consumer focused. “Healthcare has never been consumer focused the way it should be, it has been patient focused. There’s a subtle difference,” said Dowling. The doctor/patient or nurse/patient relationship has traditionally been imbalanced, with an assumption that all the power or knowledge is on the side of the medical professional. 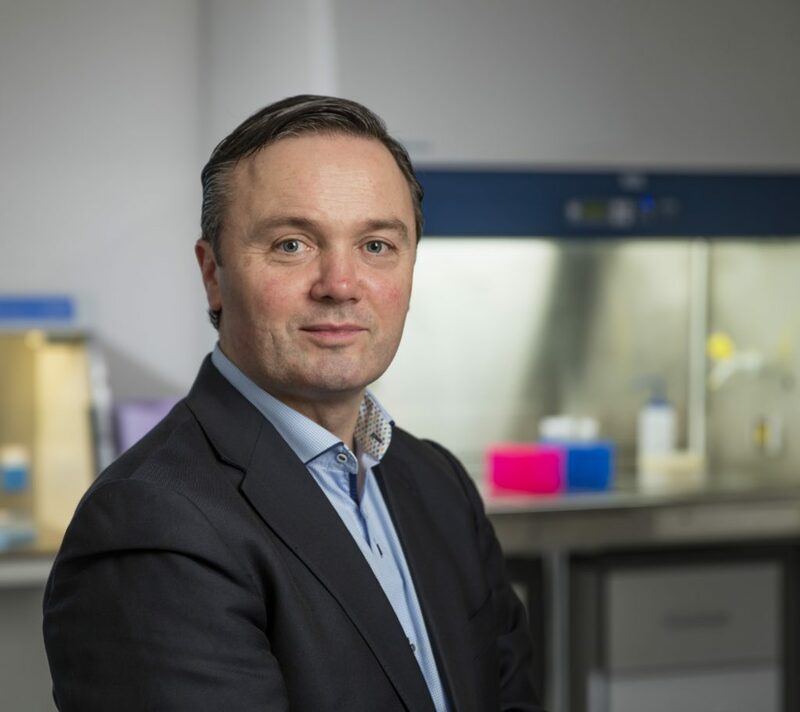 Founded in 1998 by CEO Frank Madden, Crest Solutions has grown to become a leading provider of machine vision, serialisation and managed services to the European life sciences industry. The company specialises in assisting companies in the sector to implement digital technologies and services that will enable them to become more compliant and competitive. Crest Solutions numbers some of the world’s largest pharmaceutical companies among its blue chip customer base. From vials, blister packs and cartons to labels, packs and pallets, Crest systems inspect, mark, verify, track and trace components and their associated packaging through the entire supply and distribution chains. Crest is engaged in the development of a range of advanced products in the area of industrial automation. These include augmented and virtual reality, robotics, machine vision, and Internet of Things (IoT) solutions. This strategy has paid dividends for Crest. “We have been growing at a compound rate of 35% per annum,” says Madden. When patients around the world are being tested for tropical diseases such as the Zika virus, dengue fever or yellow fever, it is highly likely that the diagnostic kit will utilise products developed and manufactured by Dublin company Aalto Bio Reagents. Founded in 1978 to supply raw materials to the global diagnostics industry, the company now has a range of 300 different reagents – 150 antibodies and 150 proteins – which are used for the identification of a vast range of pathogens. The development cycle is quite long, however. “By the time you identify and build the biomaterial and get it through approval processes with the FDA and so on, it can be 18 months,” Noone notes.